Zane Grey was many things; an author, adventurer, minor league outfielder, dentist. He was a prolific writer whose novels about the wild west captivated readers and provided his wealth. Even Hollywood jumped on the Zane Grey bandwagon, producing over 100 films adapted from his novels. He was a ‘man’s man’ who chased women (despite being married) and chased giant fish. In his later years Grey spent as many as 300 days a year in the pursuit of world record catches. He was successful in this matter, setting over a dozen records in his time including two 1,000 lb + fish, one a Marlin, and the other a Tiger Shark. So it is only logical that he would combine his two passions and give us a collection of fishing tales perhaps unmatched in the literary world. Relive the epic struggles to reel in monsters of both salt and fresh water here at Monroe Street Books. This collection, 10 beautiful leather bound volumes in total, details his fishing exploits from Tahiti to the Gulf of Mexico. Eight titles are authored by Zane Grey, with the ninth from his brother Romer. Then tenth, Zane Grey’s Odyssey, is written and signed by his son Loren and contains amazing photographs of Zane’s legendary journeys and record catches. 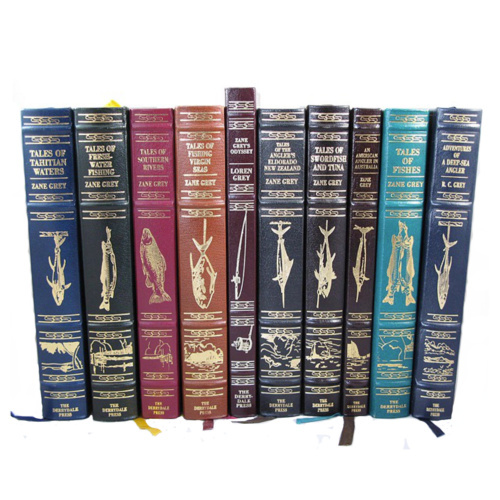 A rare and handsome collection for the avid fisherman’s library.